This Thanksgiving season, we visited our friends at Oakridge Elementary for a special holiday event. Students were greeted by our Sparkling Ice team and special guest, Clifford the Big Red Dog, for a pizza and reading party. Each student was gifted a Scholastic book of their choice. In addition to the books, Sparkling Ice gifted each student with a new winter coat, the result of a retail program in Oklahoma. 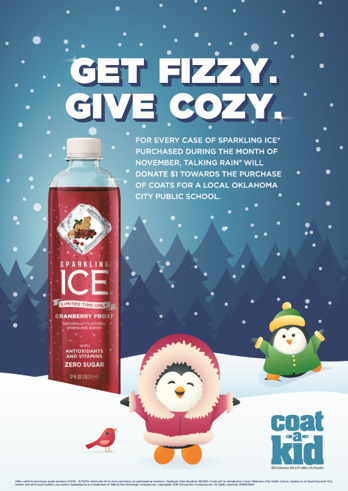 Throughout the month of November, Sparkling Ice donated $1.00 towards the purchase of coats to give to Oklahoma Public Schools for every 1 case sold.